Despite all the planning in the world, stuff happens. You may have a bug out bag packed with matches, a lighter and all kinds of good stuff, but what if you can’t get to it, lost it or it was destroyed? Or maybe your pack was soaked and the matches are destroyed. Then you are left to fight to survive on your own with what you have on you and that probably isn’t going to include matches. Before we move to how to start a fire, it is important you understand that a fire can’t be started without tinder. You need to collect dry tinder and have it ready to catch the spark. You also want to collect some twigs that will be added to the tinder once it starts to burn. The tinder can go up in just a few seconds. You don’t have time to run around looking for dry fuel. Don’t waste the spark you generate by not being prepared. 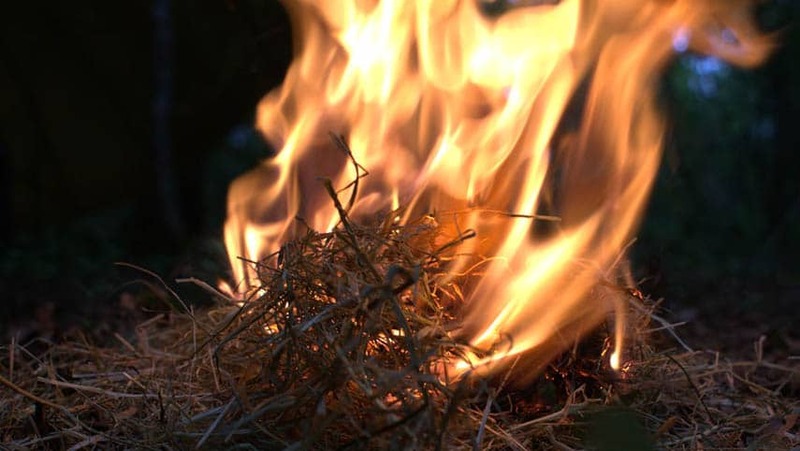 These are 5 ways you can start a fire in a survival situation, even if you don’t have matches. These ways are a little tougher and they do require more patience and effort, but a fire is well worth the energy you will expend putting into getting that first spark. The easiest way is to have an EDC lighter or a windproof one, but here go the hard ways. 1. A bow drill is an enhanced version of rubbing two sticks together. It consists of 4 pieces; the spindle, the bow, the hearth or fire board and the handhold. The hearth should be a hard wood. The spindle needs to be a medium wood. The hand hold can be a rock or a piece of hard wood and the bow needs to be a somewhat soft wood or a nice green branch. You also need cordage, like paracord or a shoestring. Cut a small hole in the hearth. This is where the spindle is going to stand in. If you are using wood for your handhold, it helps to create a small dimple in the wood for the top of the spindle to sit in. Your bow will need to be notched at each end so the cordage can be fastened to create an actual bow. Stand the spindle in the hearth, put the cordage of the bow against the spindle, put your other hand on the handhold at the top of the spindle and move the bow back and forth. The spindle should spin somewhat freely. This takes some skill to get used to how much pressure you need to apply and how fast you need to move that bow, but it will work with some time and patience. You can also use sander tool‘s dust for starting fire without matches. 2. A water bottle filled with water can be used to direct the sunlight into a tinder bundle. This way is virtually hands free. Prop the full water bottle up on a rock and place the tinder bundle in front of the bottle, far enough away that the sunlight streams through the bottle and hits the tinder. In time, the heat of the sun refracting through the water will create a spark. Make sure you keep a close eye on the sun’s position in the sky. You may need to move your water bottle to make sure the same spot is being focused on. 3. A 9-volt battery and a little steel wool will get you a quick spark. Now, you may not be able to find this in the wild, but if you do, this is a quick way to get a spark. Rub the battery terminals over the steel wool and tiny sparks will start to fly. Have a tinder bundle ready to catch the sparks. You could also use two AA batteries. Put the batteries end to end with a positive terminal on one end and a negative on the other. One D battery has enough juice to produce a spark by stretching the steel wool so a single pieces touches each terminal. 4. 2 sticks or what is known as the hand drill method. Yes, this is primitive, time consuming and your hands may end up bleeding before you can get a fire, but it will work. This method is what you have probably seen on television. Survivor rubs a couple of sticks together and boom, there is fire. It actually takes a bit more effort than that. You need to rub the two sticks together fast enough to create friction. Tiny sparks will occur at the point of friction and that is where you need to have your dry tinder ready to catch the sparks. It works best if you hold one stick with your feet while you roll the other stick between your palms into the bottom stick. This method is similar to the bow drill, but without the extra perks of a bow and handle. Choose a hardwood for the bottom stick and a medium wood for the spindle. Cut a small hole or notch in the bottom stick for the spindle to spin into. Place a few bits of tinder, like dried grass or dried moss in the notch. This notch should be on the outside of the stick in order to allow a little air into the space. Keep spinning until you see a bit of smoke. Do yourself a favor and wrap your hands with some cloth or leaves before you start spinning. 5. A mirror or piece of clear glass can be used to direct the sun’s rays into a tinder bundle. This method is effective, but you will need to have patience. Hold the mirror or glass at an angle so the sun hits the glass and reflects onto the dry tinder. In time, the spot will become heated and a small flame will erupt. You will need to stay fairly steady to keep the sunlight focused in the same area. You could use a lens from a pair of binoculars or reading glasses if you don’t have a glass bottle. Fire is a crucial element to survival. Ideally, you should always have at least two methods to start a fire with you at all times. A box of matches is great, but have a magnesium stick or flintsteel as back up. These can be reused and can tolerate getting wet. Toss one into the glovebox of your car, your purse, your desk at work and of course, your bug out bag. Since lighting fires in the open or forests can turn into wildfires, it may be a good idea to follow some health and safety training.